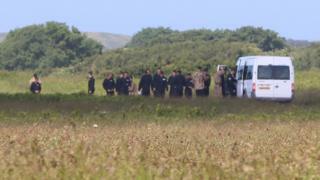 A second soldier has died following an incident involving a tank at a Ministry of Defence base in Pembrokeshire. The Royal Tank Regiment soldier died on Thursday after he was injured at Castlemartin Range on Wednesday. Another member of the regiment also died and two more were seriously injured in the incident, which is understood to have involved ammunition. The MoD, Dyfed-Powys Police and the Health and Safety Executive are investigating. Minister for Defence, People and Veterans, Tobias Ellwood, announced the second death on Thursday night. He said: "Our thoughts are with his family and friends at this sad time." Flags at the camp were lowered to half mast after the MOD announced the first death on Thursday morning. It has also suspended tank live firing as a precaution following the incident. Mr Ellwood said: "The safety of our personnel is our absolute priority and a full investigation is under way to understand the details of this tragic incident." The 1st and 2nd Royal Tank Regiments merged in August 2014 to form The Royal Tank Regiment, which is based in Tidworth, Wiltshire. The Army's website said the regiment was "preparing for a live fire exercise at Castlemartin in Wales", which was scheduled to take place at the range between Monday and Friday. Castlemartin, opened by the War Office in 1938, covers 5,900 acres on the south Pembrokeshire coast. In May 2012, Ranger Michael Maguire died during a live firing exercise at the training base. An inquest later found he was unlawfully killed.